People who are passionate about their lifestyle and talents deserve the opportunity to express this passion and celebrate their accomplishments. Running is one such a pursuit which both males and females are increasingly partaking in around the world. People run for many reasons, such as, enjoyment, competition, fitness or losing weight. Running jewelry, whether it is a bracelet, charm or necklace can motivate runners of all abilities to run harder and finish every run strong. The benefits of these jewelry pieces are innumerable: For dedicated and competitive runners Favorite Run Necklace allow runners to customize their pieces with personal records of previous races. The sight of these past successes during a run motivates them to continually strive to work harder, run further and sprint faster than ever before. Moreover, running jewelry can serve as a symbol and inspiration to people running for health reasons to remind them of what they are trying to achieve from running. This goal could be a healthier weight and mindset, greater level of fitness or developing strong cardiovascular health. In 2011, the ZOOMA Women’s Race Series announced a partnership with Jewelry designer. The ZOOMA series bestows finishing competitors with a commemorative runner necklace. This specific piece of jewelry illustrated the meaning and significance which running jewelry can impart to a runner. The runner specific necklace is a symbol of endurance, mental fortitude and determination, it is meant to remind the recipients of the hard work that went into training for and completing the race. Empowering women in their running journey through inspirational running jewelry is rewarding for the designer and runner alike. Running jewelry is designed to deliver a social, supportive and celebratory experience that inspires women to live happier and healthier lives. Running jewelry pieces can be anything that motivates you to continue on your running journey. Pendants, necklaces, key rings, beads, bracelets and charms can be inscribed with goal mileage and inspirational quotes and phrases. Alternatively, it could be adorned with images or stones that remind you of the reason we run. Whether it is health, enjoyment, competiveness or perhaps even to get from location A to B, everyone has moments where they are tempted to throw in the towel and call it a day. At these times the symbol of hope provided by motivational running jewelry reminds runners of the promise they made to themselves the second they ran out that door. That reminder is often all it takes to refocus; concentrate on gait and breathing and power it out until the end of the run. Running jewelry also adds a stylish factor for those who deign to add them to their running outfit. As any runner knows the gear you choose to wear is often just as important as the running route you plan to run or the playlist you intend to listen to. Adding running jewelry adds an extra bit of flair and individuality while also showing your support of a healthy and positive lifestyle. Many running jewelry pieces incorporate inspirational running quotes and phrases into the designs, providing the wearer with a personal connection to each piece. Running jewelry makes for a remarkable gift for friends, family and significant others who reached a milestone in their running journey such as completing a big race or reaching a desired bodyweight. The personal nature of running jewelry and its distinctiveness mean that it will not be a gift that is forgotten. 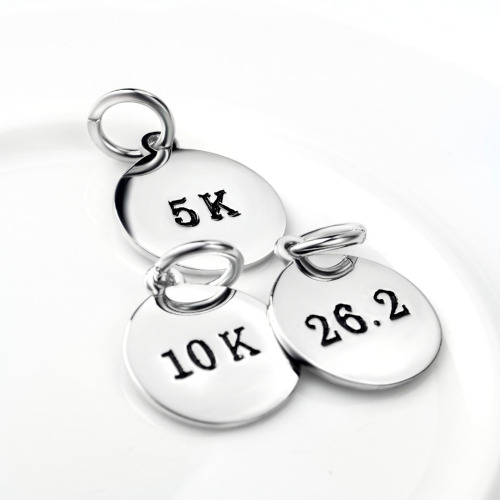 Most pieces of running jewelry are lightweight, made with 925 Sterling Silver and high polished to be non-tarnishing. You can sweat on them, have them out in the rain, spray them with perfume and they won’t rust, change color or be harmed in any way. Other gold or copper pieces might require some maintenance but this will become something you enjoy rather than a chore, caring for your running jewelry is akin to a labor of love leading up to a run. When I first started running I could barely complete three kilometers without having what felt like an aneurism. However, I stubbornly persisted and I gradually began to notice a change in my body and what I could do. Physically and mentally I was waking up rejuvenated and ready for my day to begin with a short a morning run. The aneurisms disappeared and were replaced with a satisfying stiffness in my newly forming muscles. My initial weight prior to running was 100 kilograms but after three weeks of running almost every day I discovered I had lost nearly 2 kilograms. I celebrated by heading out with my friends for a night of drunken debauchery. After weighing myself the morning after I found that I was again back to 100 kilograms. This taught me a valuable lesson about running and life in general. To hammer home that lesson I bought myself a small silver charm with the number 100 imprinted on it to remind me of why I started running. I hung my charm on a small leather bracelet and every run since I have worn it. Although the benefits of running are innumerable, being a runner is about accepting a mindset of determination and discipline. Since I started wearing my running charm I have reapplied myself with redoubled intensity. Every time I think I am close to spent or feel exhausted enough to consider stopping I glance at the silver gleam at my wrist. Because of the determination imbued in me from my charm I lost weight consistently almost every week for 7 months until I reached my goal weight of 80 kilograms. Whether you’re a seasoned runner or just starting out, there is sure to be a piece of running jewelry to help you start running, celebrate your accomplishments and motivate your efforts. Personally, I am a firm believer that one of the most important things in life is having fun. I would never have believed it 12 months ago if someone had told me the hilarity, amusement and tremendous self-fulfillment running would bring me. I enjoy stepping on the scale and looking in the mirror to see the results each week of running brings me. The true beauty of running jewelry is that it your piece of jewelry becomes far more than a simple trinket or precious pendant. It becomes something more, the embodiment of your goals and lifestyle, infiltrating your life in a way you never planned for. I hope running jewelry keeps surprising me with its seemingly endless ability to keep me running; it has been a wild ride so far. This entry was posted in Running Motivation and tagged Motivational Jewelry, Runner Jewelry, Running Jewelry.